It is time to get into meal planning mode. Are you ready? The new year is a great time for new habits and I am going to make this super easy for you. Every week I share weekly meal plan ideas for busy people. I really want to give you dinner inspiration and help you get out of the drive through lines and back to eating dinner around the table together at home. That is what our kids want- I promise you! 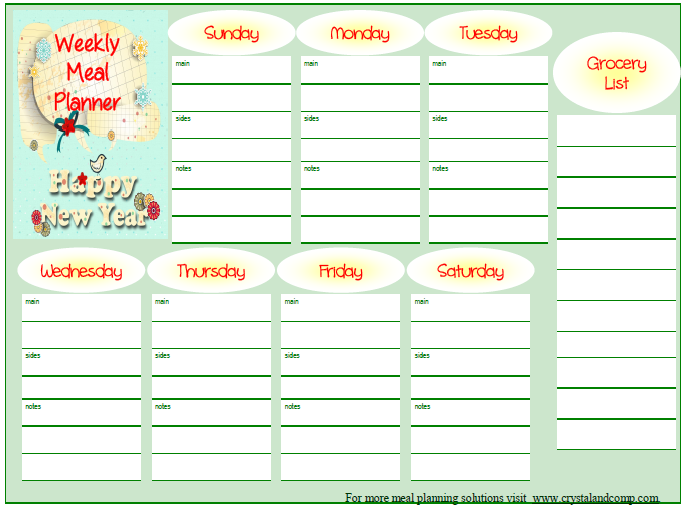 For the last few months I have been sharing with you guys a free printable meal planner. This months printable is themed for New Years. Don’t you just love that sweet little bird on there? Ready to download it for free? You can download it here! One of my readers had an awesome idea to laminate the menu and use a dry erase marker to create your weekly plan so you reuse it for the entire month without wasting paper and toner. You could also pop a magnet on the back of this so it can hang easily on your refrigerator. For more inspiration, check out three years worth of my weekly meal plan ideas I have shared here on Crystal & Co.
Also, check out the hashtag #howtomealplan on Instagram and share your dinnertime success each night! Check out more meal planning suggestions at OrgJunkie. I love this printable! This will make for a much more organized menu planning day. Yay Tanya! I am so glad you love it.